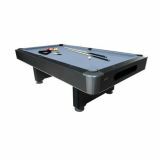 Dakota Slate Table has 3-5/8" laminate top rails with K66 nose rubber; internal ball return; wool blend cloth; metal frame rails & laminate cabinet; reinforced pedestal style legs. Includes accessories: 2 cues, set of balls, triangle, brush, chalk. Donovan Slate Table has 3-5/8" laminate top rails with K66 nose rubber; sleek contemporary edge; wool blend cloth; metal frame/rails/laminate cabinet; internal drop pockets; pedestal legs. Includes: 2 cues, set of balls, triangle, brush, chalk. 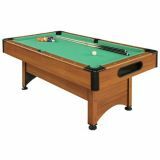 Dynasty Space-Saver Billiard Table, 78"
Dynasty Space-Saver is bamboo laminate, has automatic ball return; 5.5" wide oak wood grain laminate rails; rubber cushions; MDF play bed; green nylon cloth; black corner posts/caps/ includes 2 cutes, billiard balls, triangle and chalk. 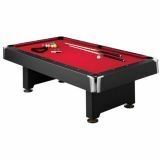 Minnesota Fats 6.5' Fairfax Billiard Table, 78" x 43.5" x 31"
Quality, light cherry laminate construction with Dur-a-Bond 69x34.5 play surface, ball return system, metal corner caps, pedestal legs with levelers and low maintenance burgundy cloth. 4.5" rail width with inlaid sights. Accessories not included. 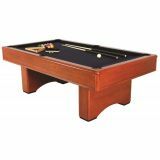 Minnesota Fats 7.5' Covington Wood Billiard Table, 96" x 53" x 31"
Carved solid wood painted legs with cherry-finished wood rails, 1" Dur-a-Bond play bed and black drop pockets. 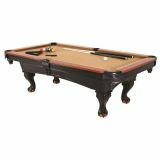 Features pro-grade wood blend cloth, inlaid round rail sights and includes game accessories. 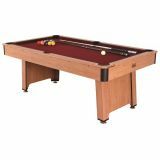 Minnesota Fats 7.5' Fullerton Wood Billiard Table, 96" x 53" x 31"
This table features fine wood veneer in dark chestnut finish with inlaid rail sites, tapered legs, 1" Dur-a-Bond Play bed with internal leveling, synthetic leather pockets, burgundy pro-grade wood blend cloth. Includes game accessories. 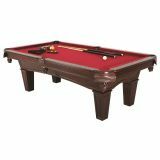 Minnesota Fats 7' Westmont Billiard Table, 90" x 50" x 31"
Heavy-duty solid construction with contemporary pedestal leg style and concealed pockets. Cherry finish veneer on rails, apron and legs, inlaid round rail sights, 1" Dur-a-Bond 78x39 play bed. Includes game accessories.